We have been collaborating with Professor Tony Dorling's group for over 12 years to develop novel targeted anticoagulant therapies. We clearly demonstrated the effectiveness of delivering a targeted anticoagulant therapeutic in a variety of pathological settings (xenograft rejection, wire injury, endotoxaemia). A new generation of orally available direct inhibitors of factor Xa and thrombin offers the potential of more effective systemic anticoagulation than currently available therapies such as heparin and coumarin derivatives (warfarin). However, the balance between effective anti-coagulant/anti-inflammatory actions and the prevention of bleeding episodes is complex (especially after surgery). Targeted delivery of anticoagulants may therefore offer more specific/effective actions without compromising normal haemostasis. Based on these original observations, we are designing, constructing and characterising novel therapeutics to deliver anticoagulants targeted to sites of vascular injury. The overriding hypothesis to be tested in this translational study is that liver-targeted delivery of recombinant adeno-associated virus (rAAV) vectors encoding the cDNA for coagulation factors can safely mediate long-term therapeutic expression of deficient coagulation factors for gene therapy. Our key collaborator, Dr Amit Nathwani, has already used this vector system to develop a promising gene therapy approach for haemophilia B, which will be evaluated in the clinic in the summer of 2009. We are now evaluating the feasibility of using this approach for a number of other coagulation factors, including factor VIII (FVIII). Haemophilia A, however, poses several new challenges due to the distinct molecular and biochemical properties of FVIII. These include a relatively larger size of the FVIII cDNA and the fact that FVIII protein expression is significantly lower than other molecules of comparable size. Novel hFVIII variants with improved FVIII expression profile have been bioengineered, which will be tested in a context relevant to humans. The bleeding disorders are single gene disorders with a defect in the gene encoding the coagulation factor. Deficiency of FVIII (haemophilia A) and FIX (haemophilia B) are X-linked recessive disorders whereas the rarer FVII deficiency is autosomal recessive disorder. Many mutations have been identified and characterized: missense, nonsense, slice site and promoter mutations as well as insertions, deletions and rearrangements. A mutation hotspot specific to haemophila A has been identified that is responsible for 50% of all severe cases in which homologous recombination of a sequence within intron 22 of the gene and extragenic copies of the sequence results in an inversion that disrupts the gene. However, the remaining mutations are unique although recurrent mutations in unrelated individuals arise at functionally important residues and in CpG dinucleotides. We have identified and characterised a number of mutations in both FVIII and FVII. 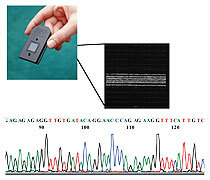 Traditional methods to detect mutations include PCR-based techniques such as single strand conformation polymorphism or denaturing gradient gel electrophoresis, which are then confirmed by DNA sequencing. While these methods are generally reliable, they are labour intensive and time consuming. Each has limitations in terms of sensitivity, fragment size (100-500 bp). DNA (re)sequencing remains the most direct method for the detection of all mutations. The gene encoding FVIII is large and complex, 26 exons spanning 186kb encoding 9000bp mRNA; FIX gene spans 30kb consisting of 8 exons encoding a 2800bp mRNA. The identification and characterization of mutations is therefore expensive and time consuming. We are developing rapid methods for the identification of mutations in the coagulation factor genes. Adenoviruses (Ad) are common pathogens. Gene transfer vectors based on Ad are used extensively in pre-clinical research. Moreover, Ad vectors are currently being used in over 25% of clinical trials worldwide, the vast majority of which are based on Ad5. In spite of this extensive utilization, the basic mechanisms that govern Ad infectivity (tropism) remain poorly understood. Ad5 vectors delivered through the bloodstream show profound liver infectivity. Despite detailed knowledge of Ad5 fiber and Ad5 penton cellular interactions in vitro many studies from different groups support the finding that such mechanisms do not govern liver gene transfer in vivo. The importance of understanding the mechanism of Ad5-mediated in vivo gene transfer and toxicity was highlighted by the death of Jesse Gelsinger in 1999 following high dose Ad5 injection directly into the bloodstream. In collaboration with Professor Andy Baker and Dr Simon Waddington we have now documented this new pathway in a recent Cell paper. We define a critical new function for the Ad5 hexon. Previously believed to be a structural protein with a passive role in Ad5-mediated infection, we show that the Gla domain of coagulation factor (F)X binds to the exposed hexon surface. The complex of Ad5:FX binds to hepatocytes through an exposed exosite in the FX serine protease domain which interacts with cell surface heparan sulphate proteoglycans. This critically important new information is a paradigm shift for Ad biology and the development and use of such viruses in pre-clinical and clinical settings. We currently aim to interrogate FX:Ad hexon interaction through a series of interdisciplinary experiments with our collaborators. This has the ultimate aim of creating effective targeting vectors through detailed interrogation of the biology of this interaction.